SEO is not for the weak of heart. The process of optimizing for organic search involve research, critical thinking, and a bit of elbow grease all rolled into one. Only people who have the patience in analyzing hard data and putting them into concrete actions will succeed in getting their sites rank on top of Google search. However, it’s one thing that you know the process. It’s another to actually do it. Ideally, an effective SEO strategy runs for years in order to keep your site on the first page of search results at the very least. That includes mining organic search for relevant information to help you develop the tactics that will comprise your strategy. Manually combing through search results is not recommended because it will take too much of your time just to collect the data. Even then, some of the information you will have collected may change over time due to the changes in the Google algorithm. All these things can be done effectively using SEMrush*. In this post, I will discuss how to use SEMrush to help you choose target keywords for your content, develop the best content possible for your post, and build relevant and contextual links to your post based on your competition. For the sake of example, I will be using the post “MASSIVE LIST: 1,343 Blogs that Accept Guest Posts” and share with you how I developed the post from the ground up using SEMrush and some examples on how to run a link building strategy for it. Let’s jump right to it, shall we? 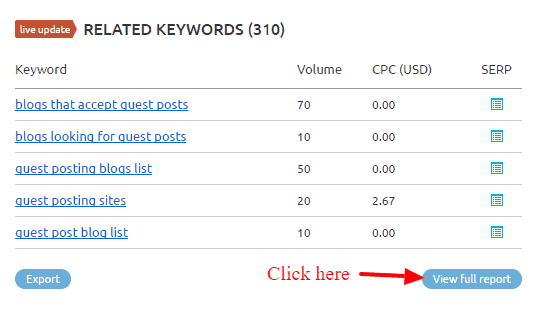 For keyword ideas before writing your post, go to the Keyword Difficulty Tool page under the Keywords Analytics category. On this page, you should already have a keyword phrase in mind that you want to optimize for. The purpose of the Keyword Overview is to validate whether the keyword has lots of search volume and is not difficult to rank for relative to other related search phrases. At the same time, you want to look for better-related keywords to optimize for. Initially, I was torn between “sites that accept guest posts” and “blogs that accept guest posts” as my keyword. Using this tool, let’s see which between the two is better. From the screenshot above, “blogs that accept guest posts” returns with data and the other keyword doesn’t. This means that the former keyword phrase is search more often than the other one, so It’s best to optimize for the keyword with better performance based on the data. I clicked on the “blogs that accept guest posts,” which brought me to the Keyword Overview page of that keyword. What you want to look for in this section are the related keywords. You may see better-performing keywords based on volume. Looking at the screenshot above, it seems like there is. To make sure that “blogs that accept guest blogging” is the best option among related keywords, click on it and look for related keywords again. If you can’t find a keyword phrase with higher search volume, then I may have unearthed the keyword to use for my blog post. However, search volume is just one of the many factors to consider when choosing keywords. You also need to factor in the difficulty of ranking on top of search results for that keyword. Initially, you should look for the SERP that is displayed at the bottom of the Keyword Overview page. 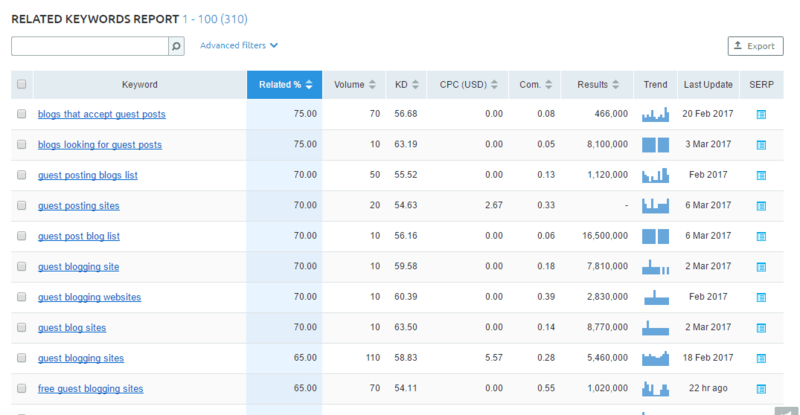 SEMrush will show you the top 100 site pages ranking for the keyword that is clustered into 20s. From here, you need to analyze each page and manually identify the strengths and weaknesses of each. Once you’ve gathered data from at least the top 10 results for your keyword, you can take actions on your findings and develop the necessary content that is better than the ones appearing on the first page. While this process remains the best way to analyze each page, it takes a lot of times to open all the pages and see them for yourself. 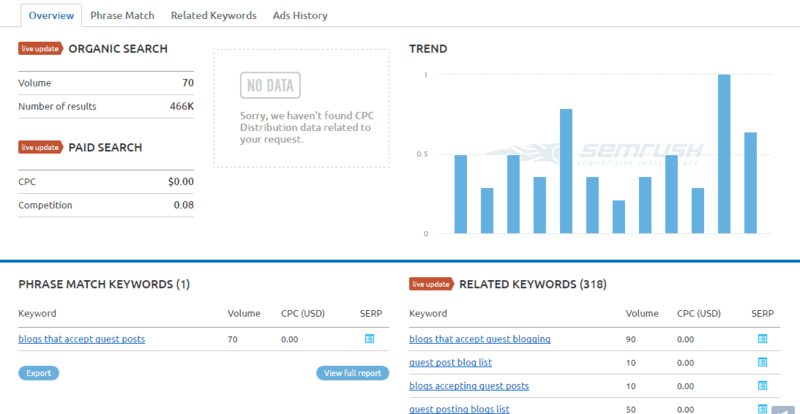 If you want to hasten the process of finding the difficulty of your chosen keyword, SEMrush has features that suit your needs. It is best practice to gather as many viable keywords that you can find. While search volume is important, you also need to look at other factors like keyword relevance and difficult (more on this later). Therefore, I took the opportunity to look into other related keywords by viewing the full report. You will be redirected to a page with the complete list of related keywords. Among the data featured on the table, you need to look into keyword difficulty. This metric factors into the pages from the SERP and aggregates the data into a figure with 100 as the highest score, which means that it is next to impossible to rank for the keyword. Therefore, the lower the KD, the better your chances of ranking for that page on the first page of search results. You can arrange the list according to KD. However, doing this showed me keywords will little relevance to the initial keyword I entered.You need to factor in the Related % column of the list so you can choose from highly similar and related keywords. (Relatively) competitive search volume – My chosen keyword has 70 search volume compared to 10 with the other one. Low KD – It has a relatively low keyword difficulty with 56.6, which ranks the 59th out of the 310 related keywords. Since the related keywords are derived from the original chosen keyword “blogs that accept guest blogging,” I would like to pit it with the chosen phrase from the Related Keyword page to settle on which KW to use for the content. After running both using the Keyword Difficulty page, it appears that there is a clear winner. Sine “blogs that accept guest blogging” does not have available data, it makes “blogs that accept guest posts” as the de facto winner! Now that I have chosen the keyword for my content, it’s time for me to use tool’s SEO Content Template feature. As mentioned earlier, manually analyzing each page from search results for my keyword is a time-consuming process. Therefore, I can just bank this feature from SEMrush so I can simply focus on the data and use the suggestions in crafting my post. Enter the keyword on the search bar to create the SEO template. The screenshot above shows actionable information that I can do with the content I will be developing for my chosen keyword. Personally, I find the readability score and word count recommendation to be the most helpful. Their purpose is to help you create a better content than the ones appearing on search results. However, these are just suggestions so you can decide on whether to do them on not for your content. For example,3,978 words for a post may be too much for my liking. After all, more words don’t necessarily mean better content in most cases. Aside from the key recommendations (based on your Google top 10 rivals), the template also shows the general SEO recommendations regarding the H1, meta description, page title, and text. As part of SEO’s best practices, you need to build links for your site pages to increase their chances of ranking on top of search results. Once the post has been published, marketers look for link building opportunities in the hopes of getting that all-valuable backlink from high-authority sites. However, in my experience, it is best that you find the opportunities before writing the post. I have detailed the process in depth in this post I wrote for SEMrush which still holds up. In a nutshell, by identifying opportunities, you can design your content that caters to the page or domain you want to acquire a link from. The method of link building requires you to consider all pages ranking on SERP to be your competitors. Your purpose is to try and hijack their position by analyzing the backlink profile of the ranking page so you can find a way to link to those pages as well. Go to the Keyword Analysis and check the SERP of the first page. Click on the first result to show the Domain Analytics overview of the page. The top-ranking page (EffectiveBusinessIdeas.com) has only four backlinks. To analyze the kind of links the top-ranking page has, I need to click on all the pages with its backlink in it. In this case, I need to check the ProCoach.com page myself. Within content – Author features the link in the article. Comment – A blogger leaves a link to the page in his/her comment or enters the URL of the page which then is linked to his/her name. List of links – The resource page is littered with links from relevant articles and content about its topic. As you can see, the link is found within the content. A possible reason for this is that the author found the content on search results or s/he is connected with the owner of EffectiveBusinessIdeas.com. I’m leaning towards the former since it ranks at the very top of the keyword I’m also trying to rank for. Comment with a link to your relevant post – Really simple and straightforward, but only if commenting is enabled on the page. However, it depends on whether the site owner is stingy when it comes to comments. If you’re not sure on how to proceed with crafting your blog comments, you need to read this excellent post at Smart Blogger. Blogger outreach – Build a relationship with the site owner by sending him/her an email and mentioning your latest post that you want him/her to link to. Of course, you need to approach this strategy with a lighter hand to not turn off the site owner. Read this post I wrote about blogger outreach before you consider implementing this tactic. Once you have identified the process on how you plan on acquiring the link, you need to find an angle on how you can pitch your post to the site in order to get a backlink. The limited number of sites to write for – At the beginning of the article, the author mentions that there are over 20 sites listed per category, which isn’t a lot. When developing my content, I can list down more than 20 – or even 3x – a number of sites that accept guest posts. Find more niches – The post features 24 categories as of writing, which is exhaustive in itself. However, maybe there are other niches I can uncover that I could include in my post. Content formatting – The post doesn’t have any images and doesn’t have social sharing buttons to make it easier for readers to like or tweet the post. These are some initial factors that I can capitalize on when developing link building opportunities for my content. Now, the challenge is replicating the process on all backlinks of your competitors. I’m not gonna lie – this is a very time-consuming process, albeit a necessary one if you want to jumpstart the acquisition of link for your content. You could probably outsource someone or delegate this task to someone else so you can focus on developing the content. 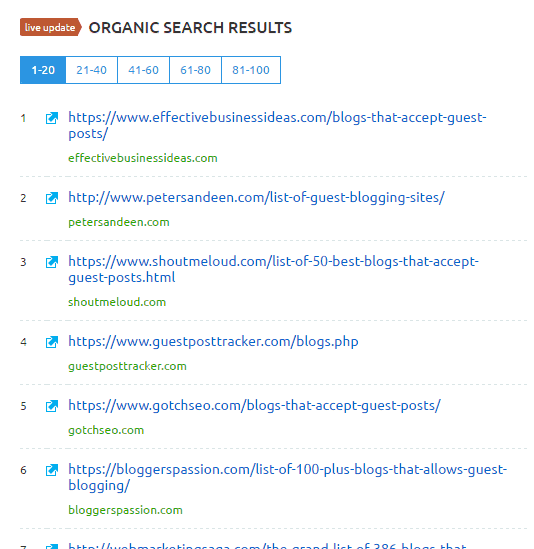 You can even potential unearth more backlinks, you can try using Buzzsumo. Read this post I wrote about how to use Buzzsumo to create killer content. The process I shared in the post goes together well with creating content using SEO’s content template. 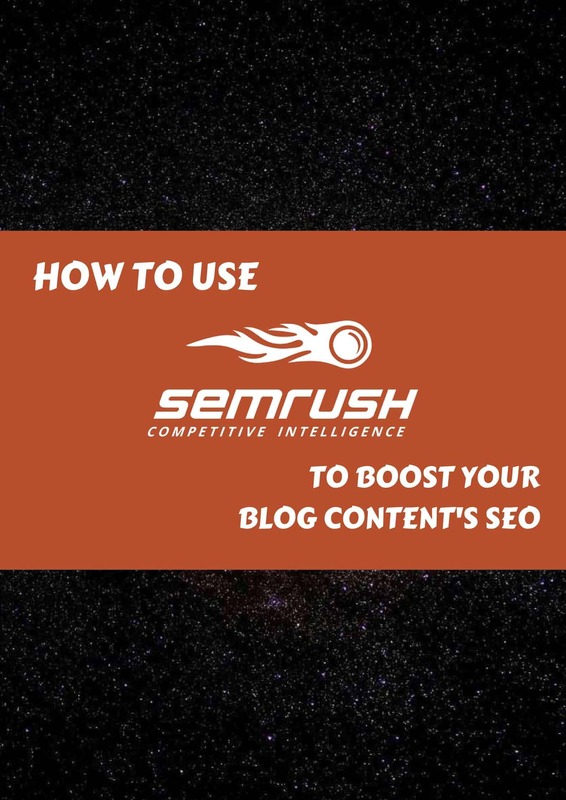 SEMrush is an excellent tool to help you supercharge your blog’s SEO performance. Applying the process religiously on all your posts will help you reach your audience by ranking high up on Google organic search and increase your traffic in the process. SEMrush costs $99/month but you can sign up for a free account and get limited access to some of the data. Doing so gives you an idea on how to use SEMrush and whether or not it’s the SEO tool for you. Click here to sign up for an account. Thanks for reading! I really appreciate you reading the post! I would appreciate it even more if you can share this post on social media by clicking on any of buttons below. If you like to receive content from this blog straight to your inbox and the occasional newsletter, please subscribe to my mailing list by clicking here!